Don’t try to transform yourselves for this session, with some idea that you saw on pinterest that looked so amazing. Be honest about who you are and take this moment to celebrate that as a couple. If you both like country music, put on a pair of cute boots and he can wear his favorite plaid shirt. Are you the ultimate power couple? Go sleek and sophisticated in evening wear. Take some time to think about what makes your relationship tick and that is something that you can weave into the session for a truly unique memory. This is one occasion where professional hair and makeup can really pay off. Similar to your wedding day, these memories will last a lifetime. It’s also a great way to test out the hair and makeup artist you want to use for the big day. You don’t want to do the same styles, necessarily, but it’s a great way to make sure they are the person you want working for you on your big day. As far as tanning goes, less is more. You want a little color, go for it. If not, don’t stress. It’s better not to tan at all than to show up looking orange. Your guy might need a little guidance with his style (or a lot), so have him get a haircut a week before your session date. He should be either cleanly shaven or have neatly trimmed facial hair for a polished, romantic look. Where? That special spot. Where was your first date? Or the moment you first met? Think of the place he proposed or other romantic, meaningful locations. Maybe only a few people will understand the full meaning of the location, but it’s a sweet reminder of the bond that you share, and will last as a permanent tribute to these good times. Your wardrobe of course should match your personalities, as mentioned before. That said, this session probably warrants a shopping trip to get outfits that complement each other as well as you and your fiancé do. Look at a color wheel for good color combinations (opposite colors on the wheel are a no brainer). If it’s a colder month, just find darker tones. For warmer months, lighter ones. Play around with color and textures, using designs like stripes or polka dots sparingly. While you want to make a personal statement in these portraits, the underlying purpose is to showcase your love. So your clothes shouldn’t steal the show. Keep things looking natural and understated, whether you’re leaning towards a casual look or ultra sophisticated one (or somewhere in between). You should try to play up your feminine nature in these portraits, as your fiancé should be extremely masculine. Whatever that means to you, bring it out. 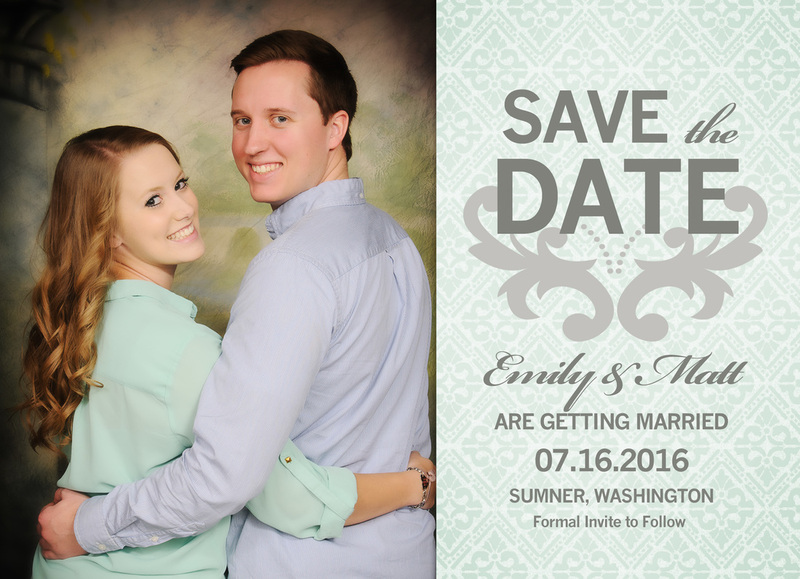 And once you have selected the perfect date for your big day, you’re ready to order your Save the Dates!